No, I haven’t committed a major sin or anything like that. This is actually the good sort of confession. In preparation for living in Indonesia, I am currently teaching myself Bahasa Indonesia. There are over 300 distinct languages spoken across the country, an archipelago of more than 17,500 islands. 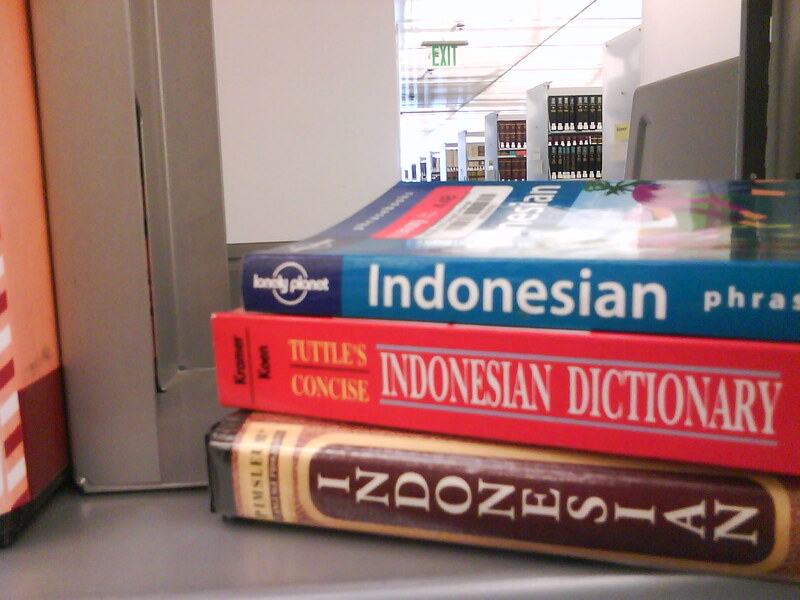 Bahasa Indonesia is the lingua franca and official language. Here’s the confession: Only days after I heard of the possibility of global mission in Indonesia, before I was even sure that I would get an interview, I discovered that the Seattle Public Library had an audio language instruction for Indonesian. I promptly checked it out and began the lessons (Free language lessons? Yes, please!). For all my efforts, I will most likely be staring blankly at people when I hear the Bahasa in the country (Saya tidak mengerti! ), at least for a few months. There will indeed be misunderstandings and misadventures. It happened to me when I arrived in Germany 10 years ago. With 3 previous years of German language under my belt, it was still not quite enough to prepare me for the rapid accented everyday speech. I just hope my first experience with Bahasa is nothing like trying Spanish in Central America. Most of the Spanish I had tried to teach myself went out the window once I arrived. Nevertheless, having a host family that spoke no English meant we had to find some way to communicate with each other. More than once the part of my brain that deals with language got confused, and spat out phrases peppered with German and Spanish. (and maybe this is the real confession) Have a good laugh: “Ja, aber muy consado,” and “Una hora ist genug” were phrases I really said. Out loud. I also tried to count and it ended up like this: “uno, dos, tres, cuatro…fünf.” When asked in Spanish how long I’d been there (30 days), I promptly answered, “Treinta Tages.” Which left me wondering, ¿Which language hablo ich, eigentlich? So it seemed my understanding of spoken Spanish made leaps and bounds in a month of immersion, but not my ability to speak the language (next time I’ll take a course taught by someone other than myself). Perhaps Bahasa Indonesia is different enough that the wires won’t cross so easily. In this process of preparing for and imagining my life in Indonesia, the best I can do is whole-heartedly learn and absorb. I need not worry about being fully prepared, because that is not possible from my current location in the world, nor is it advisable; I can’t know everything. But I can come with some knowledge and most of all, a wide open mind and heart.